Eric Morris first reported the illegal dumping in June of 2018. He called 311 multiple times and tried the mayor's office, but the trash stayed put. BALTIMORE, Md. — Eric Morris' favorite thing about living in Baltimore's Westport neighborhood is the unobstructed view of the city skyline. From his street, he can see the stadiums, iconic smokestack, and buildings that make up the Inner Harbor. It's when he walks around his home that he's reminded of the city's shortcomings. "Mattresses, box springs, sofas, cribs, recliners, garbage bags, tires," said Morris, listing off the various furniture items illegally dumped in the alley behind his home. 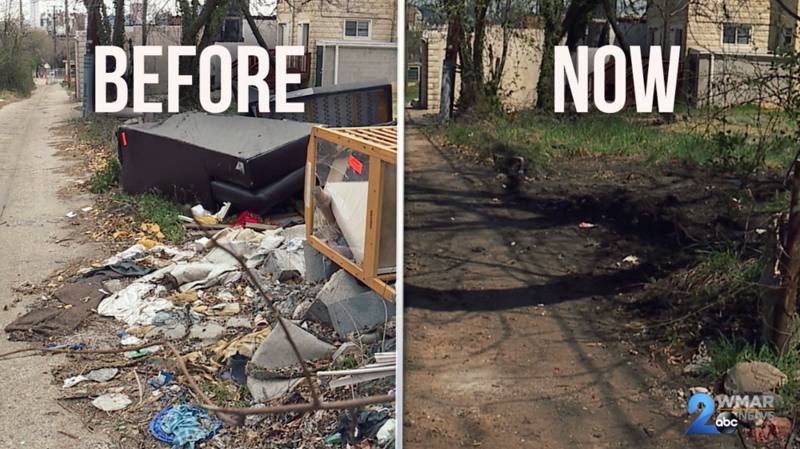 Morris called 311 to report the illegal dumping back in June of 2018, but the trash stayed put. He tried four different times and even reached out to someone in the Mayor's Office. "You've got people who care about their neighborhood, but when you have government that's basically blowing us off, it's really sad," Morris said. Morris was considering staging a sit-in at City Hall, but before he did, he called WMAR-2 News' Mallory Sofastaii . Morris showed her the dump in his backyard. It was evident that at one point city trash inspectors had been there. They left behind orange stickers marking items for removal. The date on the stickers read January 3, 2019. "Three months later and still nothing has taken place," Morris said. 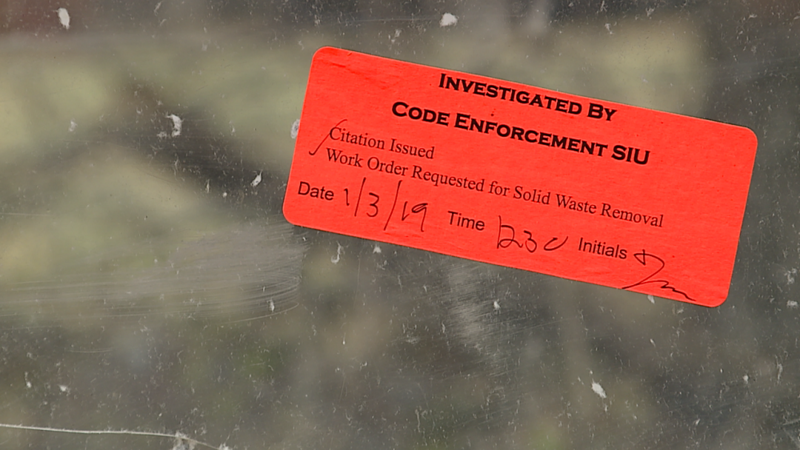 According to the Baltimore City Department of Public Works, Baltimore Housing Code Enforcement visits a reported dumping site and creates a work order for DPW to clean it once their inspection is completed. DPW supervisors then schedule responses to work orders as soon as possible. 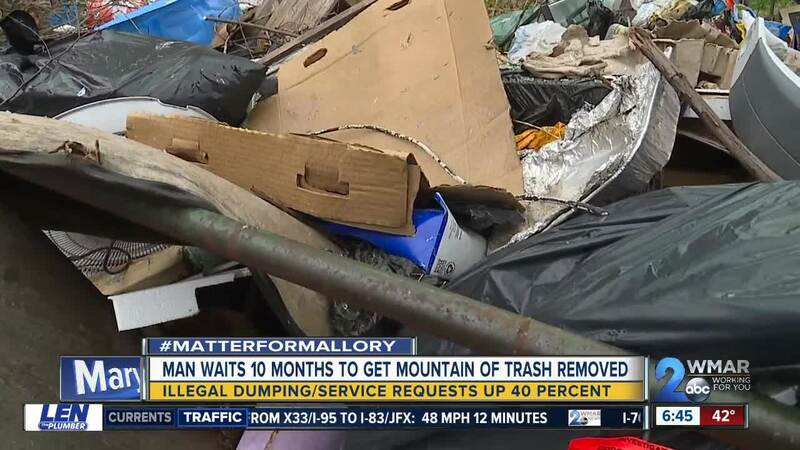 WMAR-2 News asked a DPW spokesman why the trash in Morris' alleyway wasn't removed in a timely manner. "Unfortunately, I'm really not clear on where the breakdown was in communications, but once we did learn of it, we were able to act on it pretty quickly and get rid of it," said Jeffrey Raymond, chief of communications for DPW. Hours after being notified, DPW crews hauled away the trash. "I mean, I'm very happy, I really am," said Morris. The multiple mattresses, sofas, and garbage bags had been cleared out. Crews even boarded up an abandoned shed where Morris said he saw people doing drugs. And he estimates the entire clean-up took just three hours. "I offer my apologies, and I just want people to know we take this seriously and we do get at these everyday," Raymond said. Raymond said the department is experiencing a higher frequency of service requests. In the last two years, property management requests, which include illegal dumping, jumped 40 percent. "Our resources are flat, and yet we're asked to do more and more," said Raymond. Baltimore Housing Code Enforcement can write tickets. They have 15 trash inspectors and investigators plus 74 cameras to catch illegal dumpers. However, last year, out of the more than 40,000 service requests related to illegal dumping, only 1,148 citations were issued. The tickets amounted to $724,050 in fines. Raymond said the city spent more than $22 million last year on street and alley cleaning, mechanical street sweeping, marine operations, graffiti removal, and cleaning business districts. "We could double, triple, quadruple the citations and I'm not sure we can just fine our way out of this problem," Raymond said. Their number one defense right now is people doing the right thing. And more people, like Morris, who take pride in where they live and how it looks. "I'm just happy it's not an eyesore anymore. If I decide to have a cookout, I can do so now and not try to figure out how I can camouflage all of that over here, so I'm pretty excited," said Morris. If you see illegal dumpers, you're encouraged to take a picture of their license plates and let Baltimore Housing know. You can also schedule bulk item pick-up once a month by calling 311, click here for more information . If you decide to hire someone, be sure they're a licensed trash hauler. And know that if you're caught throwing trash where you shouldn't, fines range from $50 to $1,000.